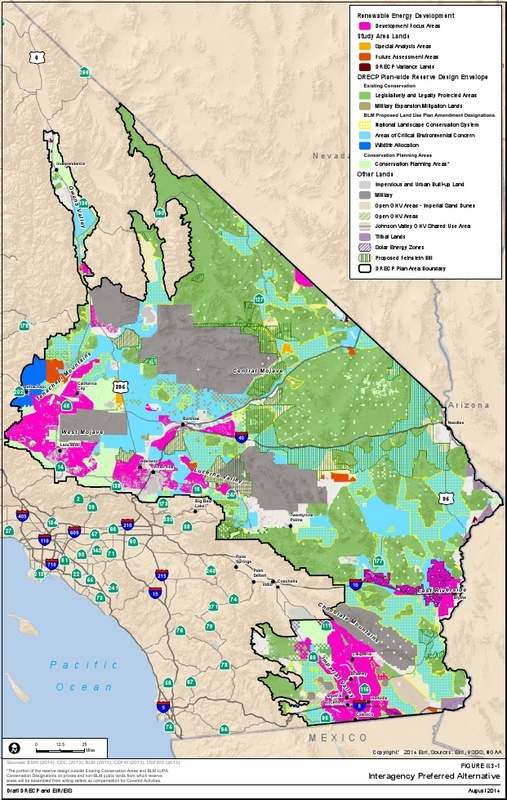 The draft Desert Renewable Energy Conservation Plan identifies 2,024,000 acres (3,162 square miles) of “development focus areas” (DFA) in the preferred alternative. Of that total, 367,000 acres (573 square miles) are on lands administered by the Bureau of Land Management (BLM). I wrote yesterday about the assumptions that were used to come up with this many acres of DFAs. On BLM lands, DFAs will allow renewable energy projects to receive fast-track environmental review. The DRECP will aim to make it cheaper and quicker for projects to be reviewed and permitted on BLM lands designated as DFAs. You can read more about the specific incentives for DFAs on BLM lands in Volume II of the draft DRECP (PDF– page II.3 – 304). On private lands, DFA status may make it easier for projects to receive Federal permits for the “take” (to kill or harass) of endangered species, although further benefits of the DFA designation for private lands will depend on the specific county’s zoning and permitting process. Imperial County shoulders the heaviest DFA burden at 734,000 acres (1,146 square miles), followed by San Bernardino County at 399,000 acres (623 square miles), Kern County at 360,000 acres (562 square miles), Riverside County at 268,000 acres (418 square miles), Los Angeles County at 218,000 acres (340 square miles), and Inyo County at 45,000 acres (70 square miles). As I mentioned in yesterday’s post about the DRECP’s assumption that the California desert must host 20,000 megawatts of renewable energy projects by the year 2040, the industry needs far less than 2 million acres to generate 20,000 megawatts. According to the DRECP acreage calculator, generating just above 20,000 megawatts would actually require developing somewhere in the ballpark of 284,000 – 351,000 acres (443 – 548 square miles). This is still an enormous amount of land, but less than the total number of DFA acres.